Maintains peer selection details and peer I/O stats. Here, "peer" is an origin server or CachePeer. Definition at line 22 of file HierarchyLogEntry.h. Definition at line 222 of file access_log.cc. References cd_host, clearPeerNotes(), firstConnStart_, host, peer_select_start, SQUIDHOSTNAMELEN, store_complete_stop, and totalResponseTime_. Definition at line 272 of file access_log.cc. References bodyBytesRead, peer_last_read_, and peer_last_write_. Referenced by HierarchyLogEntry(), and resetPeerNotes(). Account for a TCP peer read. Maintains peer response time stats (%<pt). Call this after each successful peer socket read(2). Definition at line 284 of file access_log.cc. Referenced by Http::Tunneler::handleReadyRead(), HttpStateData::readReply(), and TunnelStateData::readServer(). Account for a TCP peer write. Maintains peer response time stats (%<pt). Call this after each peer socket write(2), including failed ones. Definition at line 290 of file access_log.cc. Referenced by Http::Tunneler::handleWrittenRequest(), Client::sentRequestBody(), TunnelStateData::writeServerDone(), and HttpStateData::wroteLast(). Estimates response generation and sending delay at the last peer. whether the estimate (stored in responseTime) is available. Definition at line 317 of file access_log.cc. References peer_last_read_, peer_last_write_, and tvSub(). Referenced by Format::Format::assemble(), and StoreEntry::timestampsSet(). Start recording new origin server or cache peer connection details. Call this when trying to connect to a peer. Definition at line 250 of file access_log.cc. References clearPeerNotes(), code, Comm::Connection::getPeer(), HIER_NONE, host, CachePeer::name, NULL, Comm::Connection::peerType, server, tcpServer, and xstrncpy(). Referenced by switchToTunnel(), FwdState::syncHierNote(), and tunnelConnectDone(). Definition at line 296 of file access_log.cc. Referenced by FwdState::connectStart(), and TunnelStateData::startConnecting(). Definition at line 303 of file access_log.cc. References current_time, debugs, firstConnStart_, totalResponseTime_, and tvSub(). Referenced by FwdState::completed(), FwdState::retryOrBail(), TunnelStateData::sendError(), Client::serverComplete(), totalResponseTime(), and tunnelServerClosed(). Estimates the total time spent communicating with peers. Definition at line 344 of file access_log.cc. References firstConnStart_, stopPeerClock(), and totalResponseTime_. Definition at line 71 of file HierarchyLogEntry.h. Referenced by Client::adjustBodyBytesRead(), Format::Format::assemble(), clearPeerNotes(), and gopherReadReply(). Definition at line 60 of file HierarchyLogEntry.h. Referenced by HierarchyLogEntry(), and peerNoteDigestLookup(). Definition at line 61 of file HierarchyLogEntry.h. Definition at line 57 of file HierarchyLogEntry.h. Referenced by Format::Format::assemble(), clientUpdateHierCounters(), Log::Format::HttpdCombined(), Log::Format::HttpdCommon(), ACLHierCodeStrategy::match(), resetPeerNotes(), clientReplyContext::sendMoreData(), Log::Format::SquidNative(), and ClientHttpRequest::~ClientHttpRequest(). Definition at line 76 of file HierarchyLogEntry.h. Referenced by HierarchyLogEntry(), startPeerClock(), stopPeerClock(), and totalResponseTime(). Definition at line 58 of file HierarchyLogEntry.h. Referenced by Format::Format::assemble(), ErrorState::compileLegacyCode(), ErrorState::Dump(), HierarchyLogEntry(), and resetPeerNotes(). Definition at line 62 of file HierarchyLogEntry.h. Definition at line 63 of file HierarchyLogEntry.h. Definition at line 77 of file HierarchyLogEntry.h. Referenced by clearPeerNotes(), notePeerRead(), and peerResponseTime(). Definition at line 78 of file HierarchyLogEntry.h. Referenced by clearPeerNotes(), notePeerWrite(), and peerResponseTime(). Definition at line 69 of file HierarchyLogEntry.h. Referenced by Format::Format::assemble(), Http::Tunneler::handleResponse(), and HttpStateData::processReplyHeader(). Definition at line 65 of file HierarchyLogEntry.h. Referenced by HierarchyLogEntry(), and peerSelect(). Definition at line 59 of file HierarchyLogEntry.h. Referenced by Format::Format::assemble(), clientUpdateHierCounters(), PeerSelector::handlePath(), and Log::Format::SquidNative(). Definition at line 67 of file HierarchyLogEntry.h. 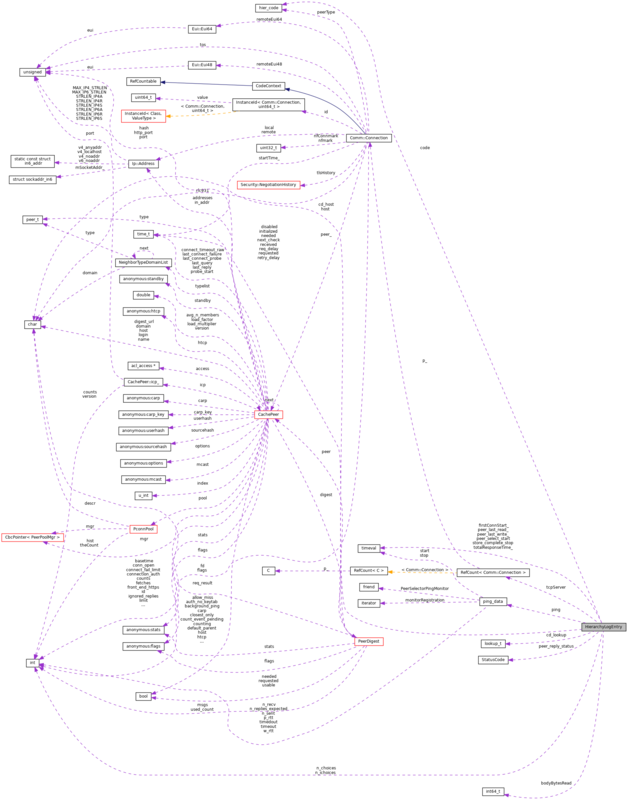 Referenced by StoreEntry::complete(), and HierarchyLogEntry(). Definition at line 70 of file HierarchyLogEntry.h. Referenced by Format::Format::assemble(), ErrorState::compileLegacyCode(), resetPeerNotes(), and Log::Format::SquidNative(). Definition at line 79 of file HierarchyLogEntry.h. Referenced by HierarchyLogEntry(), stopPeerClock(), and totalResponseTime().